London: The Bannisdale Press, 1954. 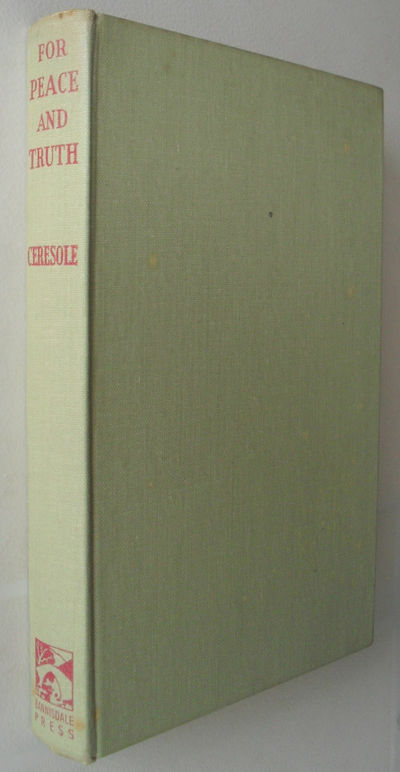 Extracts from Pierre Ceresole's private note-books, first published in a French edition "Vivre Sa Verite", translated and edited by John W Harvey and Christina Yates, with biographical notes. Rare title from the Swiss peace activist and founder of the Service Civil International. 192pp with index, black and white photograph of the author to frontis. Red lettering to spine. Boards slightly bowed, some white spotting to back board and slight foxing to top edges. Former owner's name to front endpaper, otherwise very good copy.. First Edition. Grey Cloth Boards. Very Good/No Jacket. 12mo - over 6¾" - 7¾" tall.